Velcro returns to her home village of Highland, only to find it completely in ruins. The one responsible, a mysterious foe in an eagle mask, is patiently awaiting her arrival in order to deliver his message in person, and Velcro is lured by this new enemy into a Magical challenge, one in which the outcome will determine the final fate of her home and her friends, and possibly even the world over. Meanwhile, in the village of Redfield, the Elder Chow is grooming Max to lead their brigade in the impending war against the Devil Corps. But Max won't have to wait long to be put to his first test, as war comes to their home gates in the form of this new threat running rampant known as The Masquerade. And elsewhere, unaware of all these developments, Charlie has sought out the Devil Dog for his own personal means. 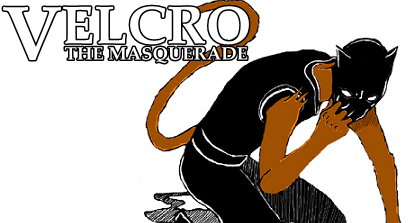 Velcro: The Masquerade adds a new unforeseen element to the equation, as the Country of Widows prepares for war. More and more, the past will catch back up with our heroes, and history will be written during their present hardships. And as Velcro faces off against her most powerful adversary yet, she'll be forced to look within and question what it truly takes to bring peace the world over. Read the first chapter right now in this special preview, then buy your copy today!